It will focus on building and — in partnership with an inspection, repair and maintenance (IRM) contractor — operating a fleet of autonomous underwater vehicles (AUVs), initially in the North Sea. KHI is starting out with a networking and sales office in the Granite City. It intends to set up a 1,000 sq.m engineering, manufacturing and stabling facility in the north-east next year. Around 15-20 engineering and support staff jobs will be created with a view of building two to four AUVs a year. The objective is to create a stable of around 15 units in five years. Executive advisor Carl-Petter Halvorsen said KHI is in advanced discussions with an IRM contractor, which will operate the vehicles and play a key role in establishing the submarine pipeline inspection with close eyes (SPICE) stable in the North Sea and perhaps in other offshore energy provinces worldwide in due course. Discussions regarding KHI setting up its AUV venture in Aberdeen started about four years ago. Leading the push today is Ken Yoshihara, who is actively building a business network within Aberdeen and throughout the North Sea. He is the first line of contact, and is now resident in the city, but remains attached to KHI’s shipyard complex at Kobe in Japan. Mr Yoshihara will be joined by the new subsidiary’s managing director, Minehiko Mukaido, around the middle of the year. 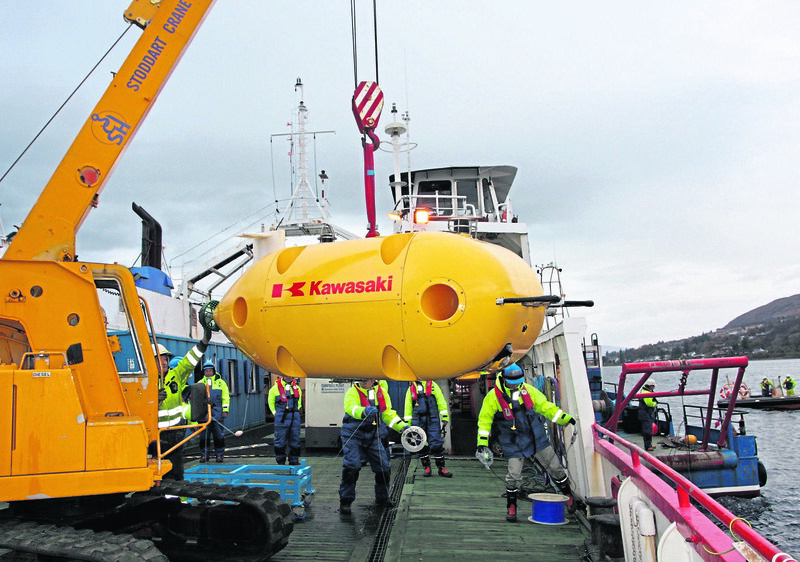 A prototype of SPICE was extensively tested at the now defunct Underwater Centre in Fort William in 2017. The results have been incorporated in the 4.5m long, one-tonne production model, which incorporates a sophisticated arm for deploying inspection technologies and other equipment. The robot arm is said to be a world first for AUVs and is based on a fusion of submarine technologies and industrial robot technologies fostered in-house over many years. Besides being one of the world’s leading shipbuilders, KHI is among the oldest submarine builders in existence, having built its first in 1906. It remains a prominent player in that market today. It has also designed and built vehicles — the so-called DSRV– for the deepsea rescue of personnel from submarines in distress. KHI’s arrival in Aberdeen is expected to help reinforce Scotland’s high standing as a leading centre of subsea excellence. It has booked space at the Subsea Expo showcase at the AECC next week. Although the primary emphasis for now is oil and gas, Mr Yoshihara said the plan was to eventually expand into subsea mapping/hydrography and the North Sea’s large and still rapidly expanding maritime renewables sector.